Celtic caretaker manager Neil Lennon is back at Easter Road this afternoon for the first time since his controversial split from Hibs. The 47-year-old Northern Irishman left Hibs at the end of the January by mutual consent, but make a stunning comeback to Scottish football this week when he was appointed interim boss of Celtic in the wake of Brendan Rodgers' departure to Leicester City. 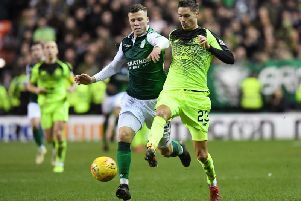 Lennon had spoken of his "trepidation" of going back to Hibs just weeks after his departure and arrived at the ground just before 4pm for this afternoon's William Hill Scottish Cup quarter-final. He led his Celtic team along the trackside with his hood pulled over his head before coming out on to the turf minutes later to inspect the scene with the stadium all but empty. Lennon joined Hibs in the summer of 2016, guiding them to the Ladbrokes Championship title in his first season. He then guided them to fourth place in the Premiership, earning a Europa League place. However, his third season did not go as planned, leaving the club officially on January 30 following a suspension. He was neither sacked or resigned after a Hibs statement clarified his position.